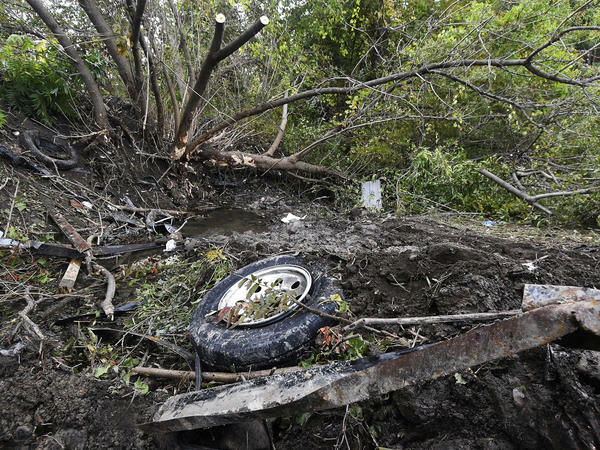 Debris litters the scene of the limousine crash last weekend in Schoharie, N.Y. On Wednesday, Nauman Hussain, identified by police as the operator of Prestige Limousine, was taken into custody. Nauman Hussain is brought into Cobleskill Town, N.Y., court for arraignment Wednesday. "The sole responsibility for that motor vehicle being on the road on Saturday rests with Nauman Hussain," New York Police Superintendent George Beach told reporters after the arrest Wednesday. Officials have previously said Hussain's father, Shahed, who has reportedly served as an FBI informant, is in his native Pakistan. 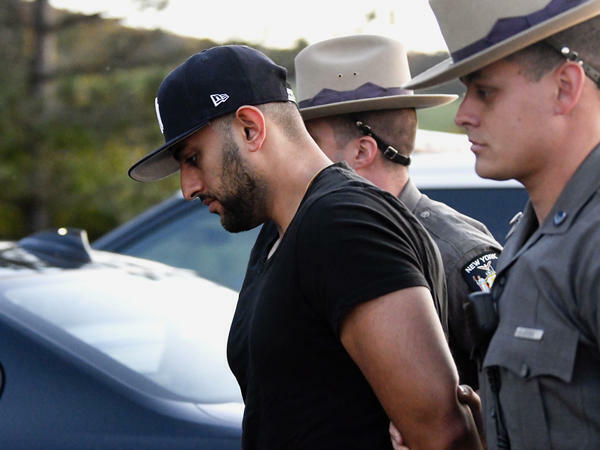 The arrest comes less than a week after a modified stretch limousine hurtled off the road and into a parking lot in Schoharie, N.Y., killing all 18 of its occupants and two pedestrians. The wreck proved to be the deadliest transportation-related accident in the U.S. for nearly a decade, according to the National Transportation Safety Board. In the days that followed, a central question has confronted investigators and the victims' loved ones alike: How could a single-car accident have caused such an immense loss of life? And as details have emerged, those questions have come to center on the actions of the company operating the limousine. "There are many red flags here with this crash," Raul Arbelaez, vice president of the Insurance Institute for Highway Safety, said Tuesday on Here & Now. New York Gov. Andrew Cuomo said the driver did not have the proper license to drive the limousine and that the vehicle itself, a modified 2001 Ford Excursion, had recently failed a state safety inspection. As Arbelaez explained, the process that turns the SUV into a limo can introduce a number of new safety concerns — ranging from fewer seat belts to brakes and tires that are unprepared to bear the added weight. "When Ford originally produced this vehicle, they engineered these things from the ground up — from the time they start with their computer models — to make sure that they comply with federal safety standards," Arbelaez said. "Once that vehicle is turned over from a manufacturer to a vehicle modifier, you start cutting up a vehicle and extending it. They make these vehicles roadworthy — but all of those changes don't necessarily make it crash-worthy." The driver of the limousine, Scott Lisinicchia, had complained about the company's vehicles before the crash, according to his widow. Kim Lisinicchia told CBS News on Wednesday that her husband had largely trusted the company that employed him — but that he also harbored some doubts. "He did complain. There were a few times where he told me, like I overheard him say, 'I'm not going to drive this, like this, you need to give me another car,' " she told CBS. According to federal records, vehicles operated by Prestige have undergone five inspections in the past two years — and on four of those occasions, the inspected vehicle was ordered out of service. "It's just a tragedy. It really is," Alan Tavenner, the supervisor of Schoharie, a town of some 3,000, told Northeast Public Radio. "It's an incredible number of people for a community this small."